One thing that’s been sitting on my cutting table is AYCEs hood pattern. I’ve really wanted to add one to a kinsman to use for winter backpacking and part of my sleep system but haven’t found the time to work on it. I’ve got enough scrap insulation and fabric to make one but figured I check with the list to see if anyone has any pointers first. I’ll most likely make one from cotton then try my hand at doing one with insulation. Not sure if anyone is reading this topic other then me but I figure in the future someone may find it of use. I’ve been working on the hood pattern the last few nights and came up with a hood patter in a shape I’m happy with. Now I’m in the process of fitting it to the pattern. 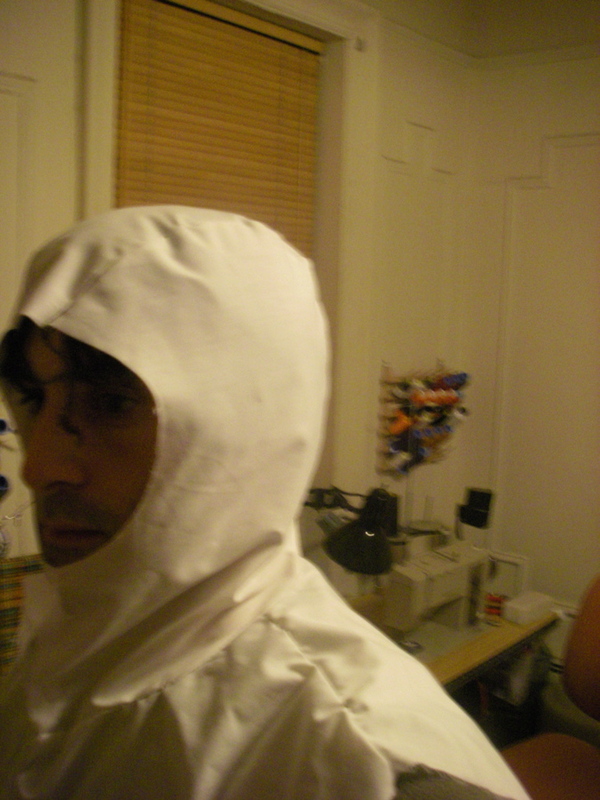 At first I was going to fit the hood to the regular neck size which the mock up in the photo’s below is made from. 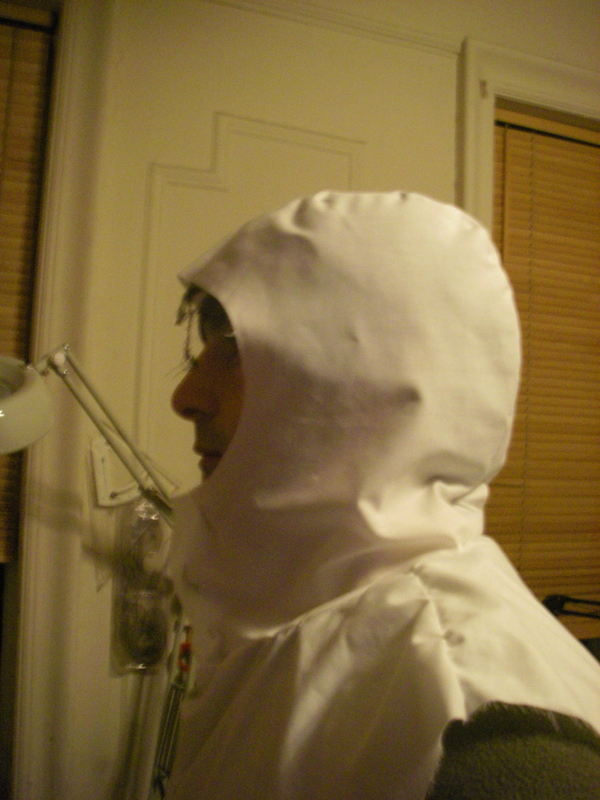 But after fitting it I realize I still need about 2” to collar to make the hood fit properly in the front. I could this by taking some from the center back of the hood but it’s already fitted quite a bit so I’m going to make the collar a bit larger. The relaxed neckline on Paul’s pattern Large just happens to be 2” larger then the one on the Med so the next step is to fit that neck to my patterns, mock up that and add the hood. As you can see I’m shooting for a non-visor type hood. Something form fitting that I can sleep in. I’m working on the same thing so I am definitely tracking this topic! Maybe I’ll be able to post a few pictures too. I’m watching it, I’d like to add a hood to the wind shell I just made. Ae you going to make the hood so that it can store in the collar? 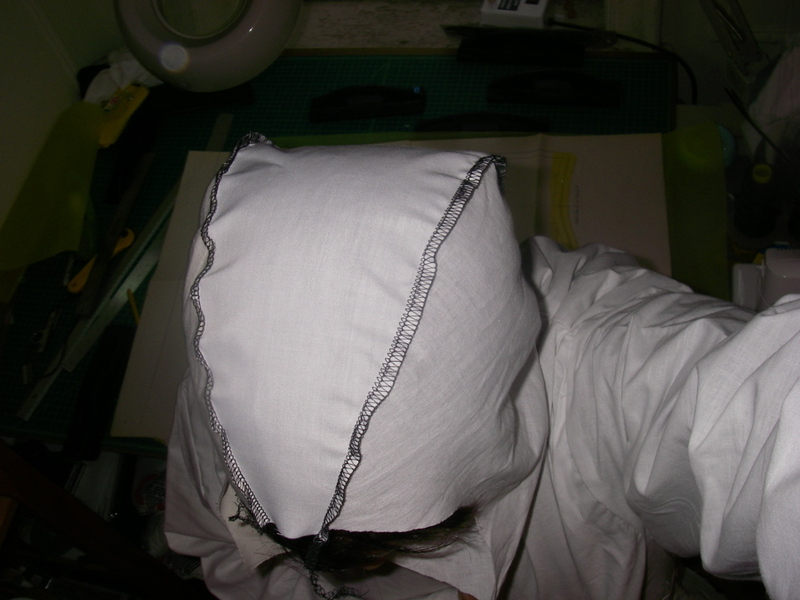 Since the hood will be insulated I’m not going to design it to be stored in the collar. I had thought about making it removable with snaps so it could be used alone but I find they never really work as well. OK, I forgot that you are working with an insulated jacket there. Ditto on the snaps. I’d just make it permanently attached or use a zipper to remove it if you really needed it to be removable. Check on the length of the hood from crown to neckline. Move you neck from L to R and watch for pulling at shoulders. Hard to tell from the pic, but you may need a little more ease in there. Also- check to make sure that you added enough to the face hole after removing the visor/drawcord casing piece. It looks like it may be a little on the shy side at the hairline (even without the seam allowance) when you draw the face hole shut, especially if you’re going to integrate the drawcord casing between the shell and liner/insulation pieces. I would agree, so I mocked up a pullover with the eased neck which adds about 2” overall, plus added 1/2 at the crown of the hood. 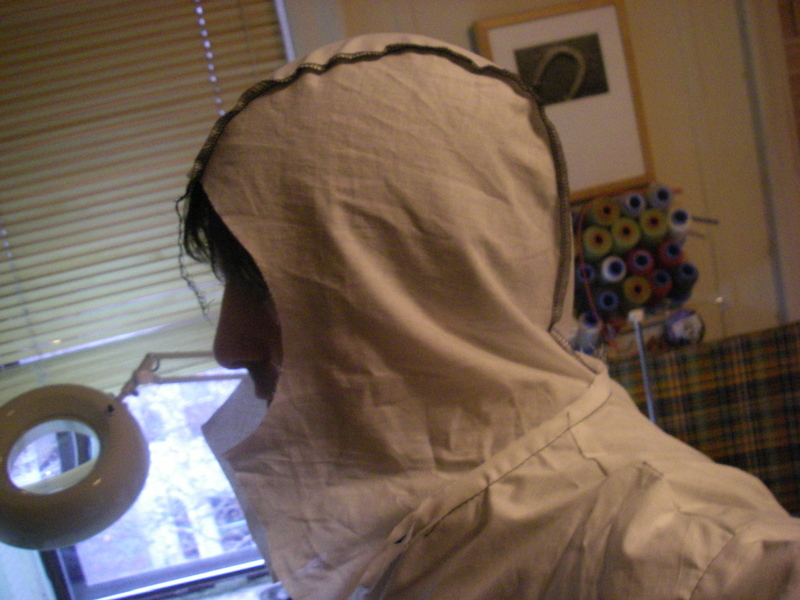 I also adjusted the jog at the bottom of the hood farther back so when attaching it the collar it ends up about where the shoulders are. I’ve been trying to understand what that Jog really does to the overall fit? 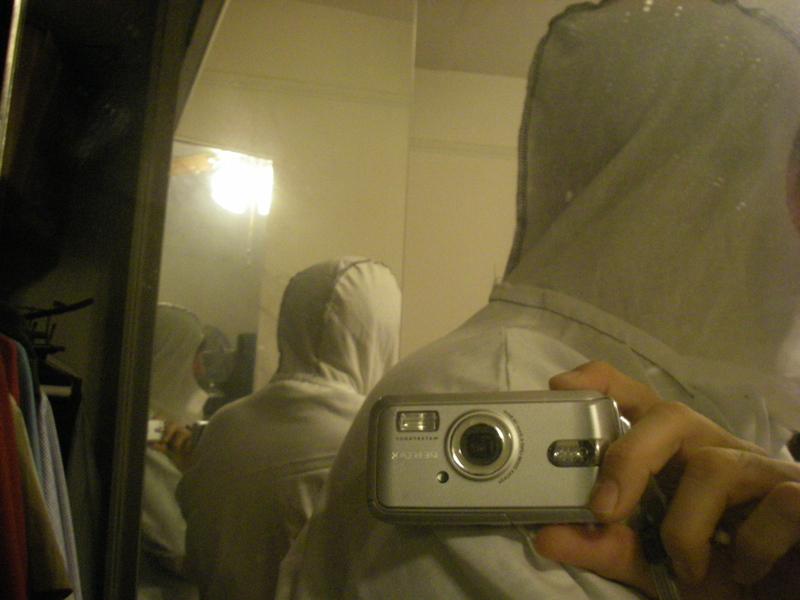 Best I can tell it just allow the from of the hood to drape better around the front of the shoulders. With this all done and looking at it. My thinking is the 2” of extra neck line from the eased pattern might be to much in the front.. . I’m thinking of reducing it 1/4 on just the two upper front pieces only. It’s hard as the cotton mock up always looks BIG because it doesn’t have insulation or the bulk of the final product. . . . I’ll do that tonight and most likely have a go with that. You will have a last opportunity to alter the size of the hood smaller after you’re attached the full liners and shell by pulling it right-side out and checking fit, then turning inside-out and sewing in the seams where needed. OK, So here’s were I’m at. The pictures aren’t great but it gives you the idea. I’ve relaxed the collar and increased the the hood over all for more wiggle room and seams. I’m happy with the fit of the hood. At this point I’ve really got to get back to some Christmas sewing so I’m putting it on hold for a few weeks. My concerns are the neck and where the hood ties into the collar. Depending on how I drape the mock up on my shoulders I have the right amount or maybe a little to much in the front. Normally I’d say no problem I can deal with it when I do the finished seams. However dealing with the zipper and draft tube in that area is already tricky so I’d rather not have to deal with adjusting the seam allowance as well! It looks right—nice job. A lot of what looks like ease now will go away when it goes from being a one-layer prototype into shell/insulation/liner. You are a couple of steps ahead of me. Just finished creating down sleeves and a matching down hood is my project for the holidays. 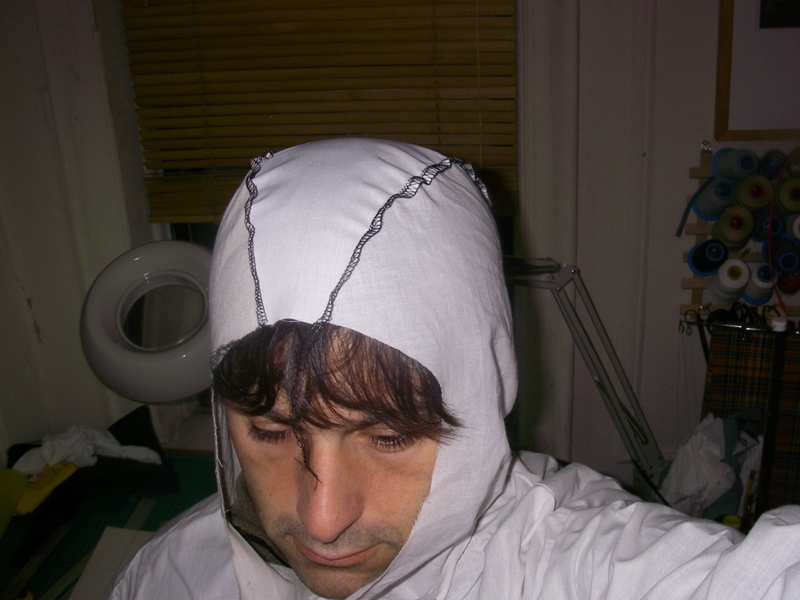 I made a single layer thru-hiker hood to go with my Liberty Ridge wind suit set and was planning to use that pattern as the starting point for the down hood. Yep - it will be a “challenge”! I was really thinking of using a xerox copier and blowing up the pattern to make it bigger for the first step. Way back when I bought some of the prequilted PL-1 Paul had for sale and will be using that. Depending on your budget you might save a little time if you can get your hands on the green pepper hood pattern. I think it cost about 8.00. I used that along with the patter Paul has. If your looking to do one without a beak the G.P pattern is helpful. I was thinking of adding a zipped hood similar to what is on the kifaru vest/parka. Many thanks for the draft-tube how-to. That’s an interesting idea one thing to keep in mind is by having the zipper in the back you loose the ability to have a single zipper in the front. one thing to keep in mind is by having the zipper in the back you loose the ability to have a single zipper in the front.